Eton Soulra XL dock takes its power from the sun | What Hi-Fi? 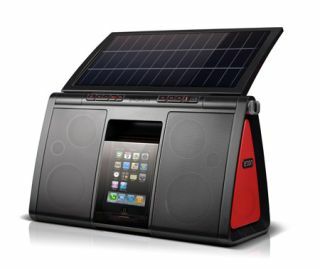 Eton reckons its solar-charged Soulra XL iPod/iPhone dock is just the thing for taking down to the beach or out on a picnic this summer. Its retractable solar panel provides up to five hours play time from the built-in lithium ion battery, and the dock itself is nestled behind a splash-proof glass screen that allows you to see the display in sunlight. Inside there are two woofers, two tweeters and four passive radiators powered by a 22W amplifer. The Eton Soulra XL will fully charge an iPhone/iPod within four hours, and it also has a gel-cushioned carry strap. A mains adapter is included for indoor use too. You can buy the Soulra XL now for £200 from www.nevadamusic.co.uk.